FK Lowry Piling delivered the foundations for 93 detached dwellings piled to an average of 8 metres, capped and beamed out within 16 weeks. The €1.3 million scheme for Fergus Haynes (Developments) was constructed over a bog, with initial ground investigation showing varying levels of peat to rock and a high water table which ruled out traditional concrete foundations. Furthermore, tributaries around the site fed into Lough Melvin, one of Ireland’s best known fishing lakes, so an environmentally sensitive piling solution was required. Our precast system eliminated the need to dig foundations and to remove spoil, thereby reducing the risk of pollution to the tributaries. 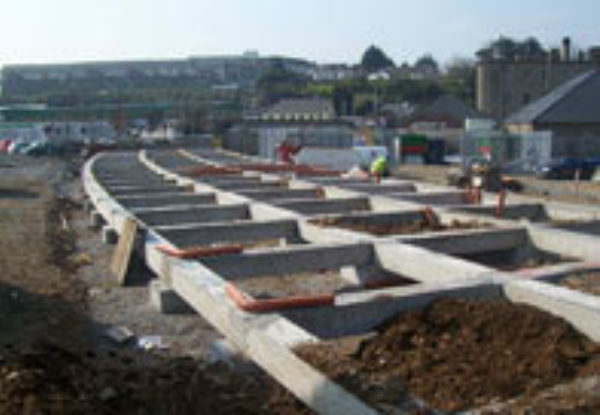 The technique also met the contractor’s need for fast track construction as the precast floor slabs and timber frames for the houses could be placed within 24 hours of the piling.